I like the flexibility of late binding injection, but how do you ensure that the binding spec is valid at runtime? How can we ensure that this binding will work? How do you test this binding dimension? So yes sadly Apex only permits compile time checks on apex classes, so the lib does support Type references like you see in the other examples via MyClass.class for example. You could use a class to define the string constants e.g. BindingNames.vf_layoutWidgetInfo as well. I might have a look at including that convention and see how it looks. Finally yes from the testing side I literally just added some examples to force-app-1. Thanks for the feedback! Hi Andrew, Its a great library to use DI in Salesforce. I have a question about the Lightning component which u have shown above which uses the c:injector and attrbute components. 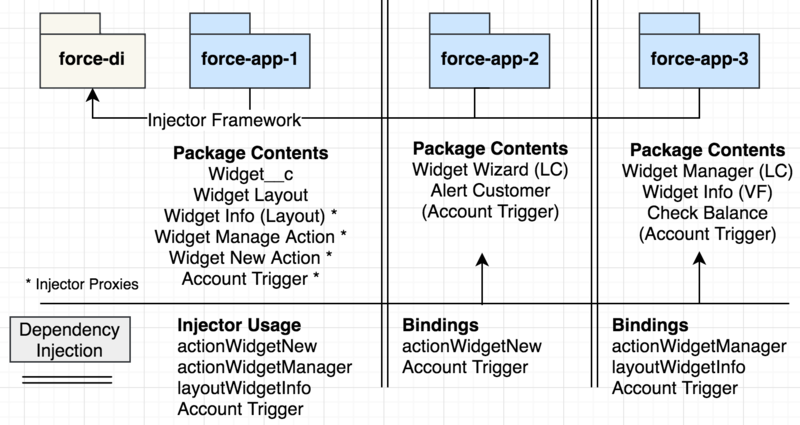 So what I understand is that instead of directly linking the component to the Quick Action we create a Wrapper or Proxy component which uses the c:injector to inject the final component at runtime. This is to delink the final component and all child dependencies from the actual button. So for every such component, we will end up with 2 components and not 1. Is that a current understanding. That is correct. But the so called “proxy component” should really never need to touching once it’s created. I also offered a naming convention to allow to be more visible as that intended purpose. Finally as this is DX you can of course place these in another folder to your main components in that package. Though the bound components and most of the work will of course be occurring in another package dir anyway. So will your module and descriptions be updated to use the Callable interface? 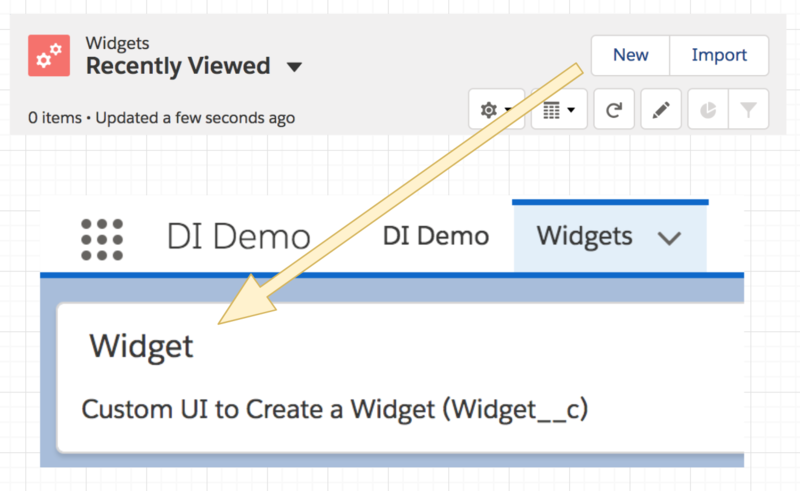 It seems like you’re also providing methods to do this on Lightning and Visualforce … are those capabilities unique to your tool at this point, or are there upcoming built-in ways to do this in VF, Lightning, page layouts, etc. Hi Andrew. So the Callable interface is really just an option depending on the dependency being strongly coupled (via a typed specific interface as shown in the examples here) or a loosely coupled interface (in which case Callable makes sense). The library makes no assumptions or requirements on which approach you want to take since you only express the implementation in the binding not the interface. For the moment i am not aware of any plans to make this native, though tweaks like Callable and others will start emerge to assist in building libraries like this. This is kinda what happened when Apex Mocks first arrived, new base API’s e.g. Test.createStub emerged in the platform while the open source lib continues to leverage and extend around it. My thoughts are my own. Firstly, thank you for this open source library, it’s nice to have a consistent approach to solving DI problems in Salesforce. An alternate option would be to use a Module binding and have that class lookup another custom metadata with the filter criteria i need & use that to create the specific instance at run time. However this would require us to manage 2 metadata types. Basically what we are trying to achieve here is, to have a base package that provides core functionality allowing subscribers to modify some behaviour by letting them override certain functionality without having to touch any of the classes in the core base package. Just wanted to check if i am missing something, is there a way i can provide support for additional filter criteria on the di_Binding__mdt by just extending a few classes but not making changes to the core force-di classes? Thank you for all the apex knowledge that you are sharing across. I started with your Apex Design Patterns Library a few days ago. Now I stumbled upon this library. Both these libraries can work together right ? If needed. Yes, both work together once deployed. Simply install the force-di unlocked package into your DE or Sandbox org will be the easiest way. 3. Referencing the unlocked package. Could the readme be updated to offer some guidance? Perhaps there’s a Salesforce-packaging-101 answer to this. Those are excellent questions! The authors of this lib and I have decided to remove the package install option for now while we work on it. Meanwhile you can absolutely deploy this to a scratch org and create your own packages (tracking the git hash in the package tag attribute perhaps). Or for a more direct deploy use sfdx force:source:deploy to send direct to a sandbox and note the git hash used at the time elsewhere for future reference. Hi Andrew. Is there a way to set up module bindings using metadata but pass in a parameter that the modules can access in their configure() implementations? 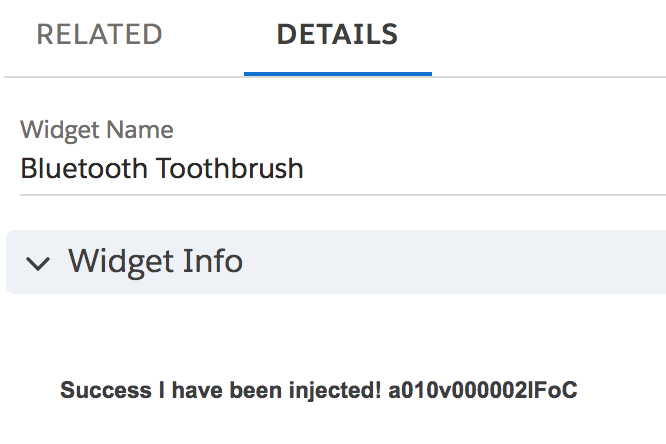 When using di_Injector.Org.getInstance(..., that is. I can see how to pass data to class bindings via getInstance, but not to modules. No not currently. Modules get their configuration from the environment. Records or other custom settings or custom metadata. Passing via getInstance would be a little odd since the modules are cached once loaded in memory so subsequent attempts to pass via getInstance would not work. What’s your use case? Thanks. Use case is conditional run-time binding in configure() that relies on data that we’d like pass in. Initial experiments had the logic directly accessing our sObject data, but in production we’d hoped to have that decoupled a bit. RegionTestFlag__mdt regions = [SELECT Id, CurrentLegislation__c FROM RegionTestFlag__mdt]; // Prefer to avoid SOQL dependency here. Hi Andrew. Indeed a great library and thank you for sharing your knowledge. I was trying to install the package via the browser but was unable to do as I get the below error. It looks like you have a class called Test in your org that is masking the standard Salesforce one. Is that the case?